What the Heck is a Peanut Ball? You may know or have heard what a birth ball is, but do you know what a peanut ball is? (No, it’s not a delicious popcorn treat.) Most women have no clue when asked this question. I actually wasn’t familiar with them either until a few years ago when one of my birth doula clients wanted to use one during her labor. They are actually really beneficial to all pregnant mamas during labor so I thought I would share this information with you! 1. The laboring mother is in a semi reclined position, with one leg over the ball, and the other leg to the side of the ball. The doula, nurse, or other support person pushes the ball as close to the mother’s hips as is tolerable to her. Many feel this position promotes dilation and descent with a well-positioned baby. 2. While the mother is in a side-lying or semi-prone position, the peanut ball is used to lift the upper leg and open the pelvic outlet. Many feel this position helps rotate a baby in a less-favorable posterior position to a more favorable position for delivery. Both of these are great position for women who have an epidural. I recommend using a peanut at every birth, but I especially recommend them to women who are wanting an epidural. This is something that you can do to help the progress of your labor and the help with the decent of your baby in your pelvis. There are actually 19 different positions that you can do with a peanut ball to help you during labor. Pretty amazing! Here are two peanut ball charts that show you pictures of those positions as well as the name of each position. These charts are perfect to share with your doula, childbirth educator, midwife, care provider or labor and delivery nurse. You may even teach them a think or two! If you are a more visual person like I am, here are some great videos that can help. They show you exactly how to use a peanut ball and they explain how you can make sure you have the right size. 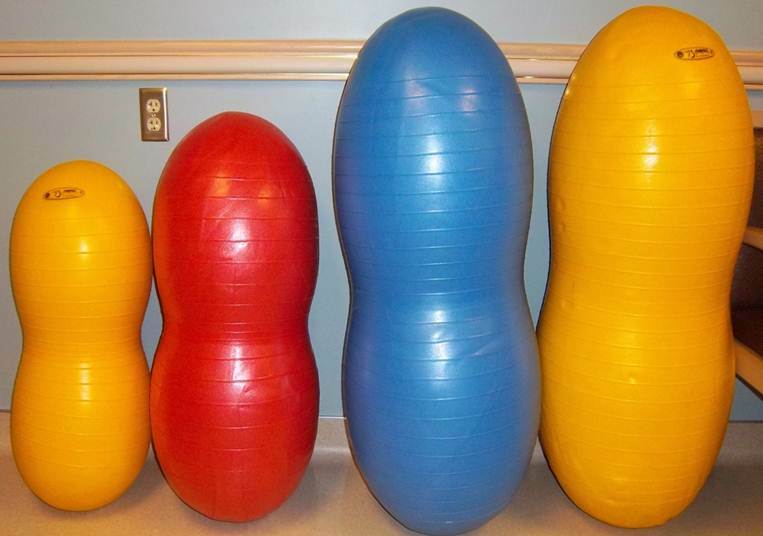 Having your baby outside of the hospital and curious what positions you can do with your peanut ball? There are some great things that you can do with a peanut ball to help the progress of your labor when you are at home. If you’re having your baby at home or at a birth center, this chart includes 10 different positions and information on which position to use when your baby is above the inlet, mid-pelvis, or the outlet. That will be so helpful if your baby is in an unfavorable position or is having a hard time getting lower in your pelvis. Shorter pushing phase – These women who used a peanut ball pushed for an average of 23 fewer minutes than those who did not. Fewer C-Sections – The cesarean rate in the group of women who used peanut balls was also 13% less than those who did not. This is a major benefit as many hospitals are trying to reduce c-section rates, as c-section deliveries typically take longer to recover from and have more potential for complications. They also cost more, so there is a big potential to save money for both patient and hospital. These effects were especially pronounced in women who had an epidural. However, using a peanut ball would be effective in any woman who needed to lie down on her side during labor. Where can I get one and what size do I get? As for purchasing a peanut ball…you could buy one from Amazon, however, those usually are not rated for pregnancy and have even burst while in use. Definitely not good! We recommend purchasing one that is specifically rated for pregnancy. Check out this link here for quality, pregnancy approved peanut balls. You can also purchase peanut balls on Amazon. If you are wanting more information on peanut balls, you can receive a FREE informational packet from Premier Birth Tools. Just go to their ‘Contact Us’ page and ask for the FREE PDF informational Packet on Peanut Balls and their use in labor. Happy birthing!! Did you use a peanut ball during labor? What was your experience like using one? We have partnered with Premier Birth Tools for this post and are so grateful for their guidance and trusted information.